Treatment for Paget’s Disease aims to correct the bone deformity that results from the disease progression. At the Paley Institute we correct the deformities with specialized osteotomies (surgical bone cuts) and fix the fractures with external or internal fixation. Below is an example of treatment for Paget’s disease. The bone was cut in two places and an external fixator applied. The bone was then gradually straightened and realigned. The regenerate bone that forms is healthy bone, rather than the weak Pagetic bone. The external fixator remains in place while the bone heals. 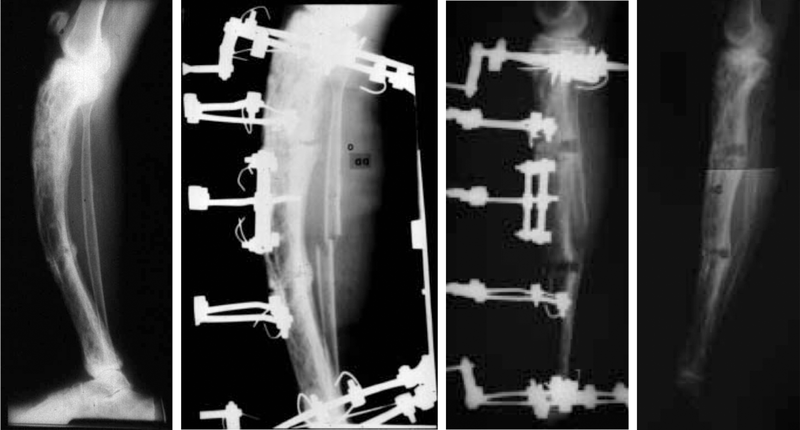 Once the regenerate bone is strong enough, the external fixator is removed. Paget’s Disease may also affect the surrounding joints, such as the hip or knee, resulting in arthritis. We can correct this using specialized joint preservation techniques. For more information, please see Joint Preservation.